The Vancouver Condo Buzz » ALL-IN OFFER UNTIL JUNE 30th! HARMONY Richmond City Centre Condo Tower by Townline & Peterson Group! 1 Bed+Workstation to 2 Bed+Den Floor Plans | 119 Suites for Sale at the Presale Richmond Harmony Condos > REGISTER HERE! « First Release March 2nd! ROYCE White Rock Condos from low $300’s by Forge Properties. Unobstructed Panoramic Views from these Oceanside White Rock Homes at Royce Living! ALL-IN OFFER UNTIL JUNE 30th! HARMONY Richmond City Centre Condo Tower by Townline & Peterson Group! 1 Bed+Workstation to 2 Bed+Den Floor Plans | 119 Suites for Sale at the Presale Richmond Harmony Condos > REGISTER HERE! Harmony by Townline is a dynamic and new community located in the highly sought after and ever popular Central Richmond real estate district. Right in tune with a healthy urban lifestyle, the new Harmony Richmond condo project by Townline combines on site amenities with tranquil and healthy living spaces, extending beyond to your new walkable and pedestrian friendly neighbourhood. This landmark building is inspired by history and the stunning modern architecture designed by world renowned Raffi Architects pays homage to China’s rich cultural history. The Harmony Richmond condo tower architecture resembles ancient Chinese paper cutting and the concepts of Yin and Yang. The ‘paper lantern’ style architecture of the new Richmond Harmony condo tower makes it truly unique with decorate panels that reflect light and with an inverted canopy base which is very striking. The Townline Harmony Richmond condos for sale also feature a perfect balance between positive energy and vibrant, healthy living spaces. The address at the new Townline Harmony Richmond condo tower is at 8288 Granville Avenue Richmond BC. The high-rise is 16 floors and there will only be a boutique selection of 119 market suites for presale. The new Richmond Harmony condos for sale will also feature an expansive outdoor amenity space hovering around an incredible 15,000 square feet of space. The Townline Richmond Harmony condo floor plans will range in size between 525 square feet to about 950 square feet (approximate and subject to change). The Harmony Richmond condo floor plans will also range in layouts between 1 bedroom +work or den to 2 bedroom and den homes for sale. Presale Richmond Harmony condos start from just $288,000 for 1 bedroom suites, which is very comparable to today’s market pricing. In addition, the 2 bedroom suites at Harmony Richmond condos for sale start from the mid to high $300,000’s range with 2 bedroom and den starting from the mid to high $400,000s. 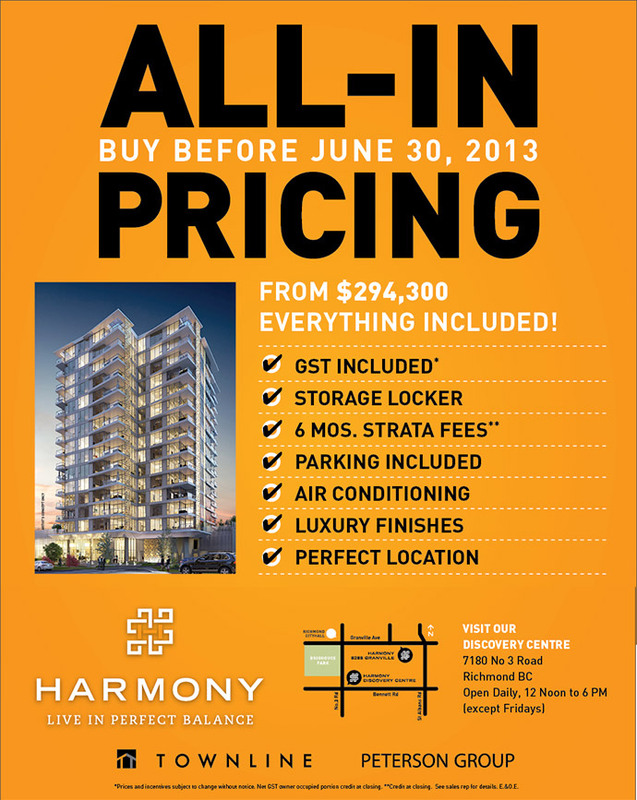 The starting presale Richmond Harmony condo pricing is very competitive and gives homebuyers great value. Harmony Condominiums will consist of 119 beautifully appointed residential homes including 1 bedroom + workstations starting from 526 sq. ft., 1 bedroom + dens starting from 634 sq. ft., 2 bedrooms from 719 sq. ft. and 2 bedroom + dens starting from 935 sq. ft. Despite recent concerns about the Greater Vancouver real estate market, Richmond property continues to be one of the top places to live and invest in property. One of the key elements to purchasing a property is its location. These pre-construction Richmond Harmony Condos by Townline are situated in a calm oasis just minutes from the vibrant Richmond City Centre real estate district, giving residents the best of both worlds. Whether you are traveling around the city or around the world, a home at Harmony Richmond City Centre condos makes it an ideal starting point for any homebuyer. The new Canada SkyTrain Line is just minutes away, as is easy access to major highways, bus routes and YVR Airport which is less than 10 minutes away. As well, the pre-construction Richmond Harmony condos by Townliine Group are just twenty minutes away from downtown Vancouver. But best of all, there isn’t a need for a car or to drive anywhere for international dining options, world class shopping, entertainment recreational facilities and local services. EVERYTHING is within walking distance from the pre-construction Richmond Harmony condos in Richmond City Centre real estate district. Not only that, but top ranked golf courses, Terra Nova Rural Park, Richmond Nature Park, River Rock Casino, IKEA and idyllic Steveston Village are within 10 minutes drive away from the new Harmony Richmond condos by Townline. The dyke trails for biking and jogging, Polytech Uni, Lansdowne Mall, Gateway Theatre, Richmond General Hospital, parks and restaurants are within a 10 minute bike ride away. In addition, you can walk easily from the pre-construction Richmond Harmony condos to Richmond Centre, the Canada SkyTrain Line, Minoru Sports Complex, City Hall, Public Library and Garden City Park within ten minutes too! Here are some of the highly anticipated kitchen finishes at the Townline Harmony condo project in Central Richmond: solid eased square edge QUARTZ counters with WATERFALL edge and full height quartz backsplash, elegant square edge, flat panel cabinetry with SOFT CLOSE doors and drawers and modern hardware as well as versatile OPEN SHELVING and additional PANTRY space. In addition, the kitchens at the presale Richmond Harmony condos will feature oversized STAINLESS STEEL single bowl undermounted sink, Euro style high arc chrome faucet with pull out spray and recessed pot lights. The GOURMET appliance set includes a Panasonic built in microwave, KitchenAid stainless steel Energy Star dishwasher with hidden controls, Broan low profile ss hood fan, KitchenAid 30” stainless steel gas burner stove with InstaWok technology and warming drawer, and a Samsung stainless steel energy efficient bottom mount fridge with digital controls, quick freeze and door alarm technology. Just like the kitchens, the bathrooms at the new Harmony Condominiums in Richmond real estate market will feature elegant square edged flat panel cabinets with SOFT CLOSERS and stainless steel pulls. The bathrooms will also have SOLID and THICK ease square edge QUARTZ counters (better than marble or granite) with under mount sink and chrome faucet by MOEN. The deep five and a half foot SOAKER TUB with full height ceramic tiled surround will be beautiful as will the hand set large format polished porcelain floor tiling. The bathrooms at the presale Richmond Harmony condominiums by Townline Group of Companies will also feature a chrome RAINFALL SHOWER HEAD by Moen in addition to modern low flow dual flush toilet with soft closer for the seat by American Standard. The interiors are designed by i3 Design Group and there are two warm and distinctive designer colour palettes for you to choose from. There are oversized flat profile baseboards, low E and oversized double glazed windows, decora style light fixtures, fully wired home office workstations with quartz counters in select floor plans, wide plank laminate flooring in the dining/living and kitchens as well as durable 100% nylon cut pile carpeting in the bedrooms. All windows will have horizontal blinds and all homes will have stacked front loading high efficiency EnergyStar washer and dryer. There is key fob access into the building and common areas and 20% of all residential parking stalls at the new Harmony Richmond apartments for sale will have electrical outlets. All homes come with the Travelers Guarantee Warranty too. Competitively priced from just $288,800, these elegantly appointed, feng-shui sensitive new Richmond Harmony homes are well within reach. The team behind the new presale Richmond Harmony Condos includes Townline and Peterson Group, Rafii Architects Inc and i3 Design Interiors. Also, Sherman Tai was the Feng Shui Consultant at Harmony Richmond condos. Situated centrally on Granville Road, the HARMONY Richmond condo project presents ‘life in balance’. Close to all the core amenities of Central Richmond BC real estate market, the pre-construction Richmond HARMONY condos are set to launch some time in early Spring 2013. The peaceful setting of this new project is what makes it so unique and special. But these new urban condos are also within walking distance or a short drive away from everything you want including great dining options, shopping, big box retailers, malls, the SkyTrain, bus routes and the water. There will be a total of 119 high-rise Richmond HARMONY condos for sale come 2013, so stay tuned for more information. 119 thoughtfully designed high-rise Richmond Centre condos developed by Townline Homes and The Peterson Group are coming to the market in early 2013. The timeless and contemporary architecture at the preconstruction Richmond HARMONY condos is by Rafii Architects and the Sherman Tai Feng Shui master consulted throughout the design stage of the project. There will be an impressive open concept double height lobby at the preconstruction Richmond Harmony condo building with an integrated lounge and bordered by a soothing exterior water feature. There is also a full service concierge desk. The Richmond Harmony Gym and Lounge will include a fully equipped fitness room with yoga space, games area, kitchenette and dining area as well as a cozy fireplace lounge with large flat screen TV. The 15,000 square foot landscaped rooftop haven at Richmond HARMONY Condos for sale on the 3rd floor podium deck will include a gated and landscaped perimeter dog run, low lying custom wood observation platform deck, family friendly BBQ areas, tree lined children’s play area with lush lawn and a meandering 100 metre long pathway. Also, the landscaped rooftop haven at Richmond Harmony amenities floor includes a trellised Zen Garden, charming wooden bridge and much more. There are two high speed elevators, secured visitor parking, bike storage and spacious open air balconies. Please note that all new Richmond Harmony floor plans have in suite laundry. The ground floor units have larger outdoor living spaces too. A sophisticated collection of high-rise homes in Central Richmond real estate market. Welcome to Townline Harmony Condos in Richmond BC, a stunning new residential community featuring only 119 homes. Conveniently located within walking distance of public transit, local parks, shops, cafes and restaurants, yet far enough away from the traffic and congestion, the Townline Harmony Condos in Richmond BC presents the perfect balance between convenience and serenity. It’s a home perfectly in tune with all the elements of your life. It’s brought to you by leading developer Townline Group of Companies in conjunction with the Peterson Group. The presale Harmony Richmond condos is a 16 storey tower with a distinctive collection of 119 contemporary suburban high-rise condos. The Richmond Harmony condo pricing starts from the high $200’s. The Townline Harmony condos in Richmond BC will be conveniently located at 8288 Granville Avenue, Richmond. Harmony Condominiums will consist of 119 beautifully appointed residential homes including 1 bedroom + workstations starting from 526 sq. ft., 1 bedroom + dens starting from 634 sq. ft., 2 bedrooms from 719 sq. ft. and 2 bedroom + dens starting from 935 sq. ft. Harmony’s 2100 sq. ft. Discovery Centre is currently under construction and will be opening in the spring of 2013 on the corner of No. 3 Road and Bennett Avenue, one block west of the actual site.